The most exclusive tickets in NYC are Statue of Liberty tickets for INSIDE the Statue of Liberty Museum and there is only ONE way to get this reservation. Do not confuse Statue of Liberty tickets with Statue of Liberty boat tours to Liberty Island to walk the Liberty Grounds. 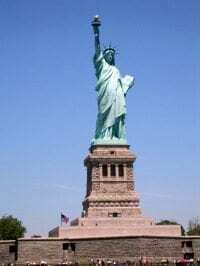 Liberty Island and Ellis Island are two different islands off the southern tip of Manhattan. The guides recommend 2.5-3 hours to see one island or 5-6 hours to see both. As of July 4, 2009, Lady Liberty has re-opened her Crown for us to climb (the crown was closed after terrorist attacks of 9/11/2001). 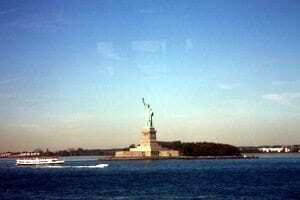 Getting to Liberty and Ellis Islands is easy and the Ferry Boat, including an audio tour, is $19 Adults, $14 Senior; $9 Children 4-12, Free Children under 4. Getting Statue of Liberty tickets, or a reservation, to actually enter the Statue of Liberty Museum, which costs $0, is the difficult part and usually booked 3 or more months in advance. Reservations for Statue of Liberty Tours are accepted up to one year in advance. Make sure to check for elevator outages, or be prepared to climb 168 steps to get to the Museum (different than climbing the crown). Skipping Vacation Planner Step 3? Continue to New York City Broadway Tickets. The 4.5 hour tour begins when you meet your expert guide at Castle Clinton in lower Manhattan and then board the ferry that will take you to both Liberty and Ellis islands (priority boarding access is included). You’ll start on Liberty Island, where you’ll learn about the history of the Statue of Liberty, and recieve a guided tour of the museum in the statue’s pedestal. Then, on to Ellis Island, where your guide will share stories of the many immigrants who passed through the buildings, followed by a tour of the grounds and Ellis Island Museum where you can look up the records of your family members. These Guided Statue of Liberty and 9/11 Memorial Tours offer a tour guide who meets you in Midtown (51st and Broadway, near Times Square) and takes the group on the subway to Battery Park, where you have special reserved priority access to enter the Liberty Island Ferry security, and a special reserved Monument Access Pass granting guaranteed entry inside the Statue of Liberty Museum. Note: These tours will offer views of Lady Liberty, or the ferry to Liberty Island, but not entry to the Museum, which you can book separately. 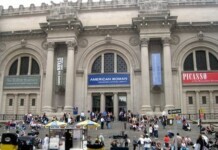 The All Loops Tour offers ticket holders 48 hours of sightseeing aboard the Gray Line’s famous double-decker buses on the four main itineraries: Uptown, Downtown, Brooklyn and Night. 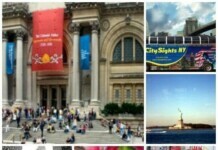 Great, now that you have Statue of Liberty tickets, you can plan your itinerary around visiting the Statue of Liberty and also note to yourself, when evaluating any Tours, Bus Tours and Attractions Passes, you have already paid the $18 Ferry fee and secured your spot on the Priority Security Line. No problem! There are still many options to view the Statue of Liberty, go to Liberty Island and walk around the grounds and/or see one of NYC’s best attractions, the Ellis Island Immigration Museum. If you really want to see inside Lady Liberty, try for Statue of Liberty tickets at the main ticket booth, available on a first come first serve basis. Try to secure Statue of Liberty Tickets from Liberty State Park (the New Jersey side). You will have to take PATH train from NYC to board the Ferry, but you can take the ferry back to Battery Park City. See her up close from the water, by taking the FREE Staten Island Ferry. Buy a Ferry ticket (Flex Pass) or use the Ferry Pass included in all the sightseeing discount passes, to go to Liberty Island (to walk around) and Ellis Island, including the Ellis Island Immigration Museum, which is well worth seeing! See the original sonnet Statue of Liberty Inscription (The New Colossus) at the American Jewish Historical Society. If Statue of Liberty tickets are not an option, then the Staten Island Ferry is a great choice for those with less patience for lines and Musems. Kids love the SI Ferry. It’s free, passes very close to Lady Liberty, runs every 30 minutes and takes approximately 25 minutes each way. NYC Insider note: 1, 4, 5, N, R subway lines as well as the M1, M6 and M15 bus lines., Exit South Ferry, Whitehall Terminal is the Manhattan port and St. George Terminal is the Staten Island port, 4 South Street. Enjoy spectacular aerial views of Manhattan on one of our many NYC Helicopter Tours. Times and tours vary, but you will likely see the Statue of Liberty, Wall Street, Ground Zero Memorial, World Trade Center and Ellis Island downtown. If your tour heads uptown, Central Park is gorgeous from the sky, and near some of the beautiful buildings that make up our world-famous skyline, such as the Empire State Building, Chrysler and Met Life Buildings. Chinese food with a view! 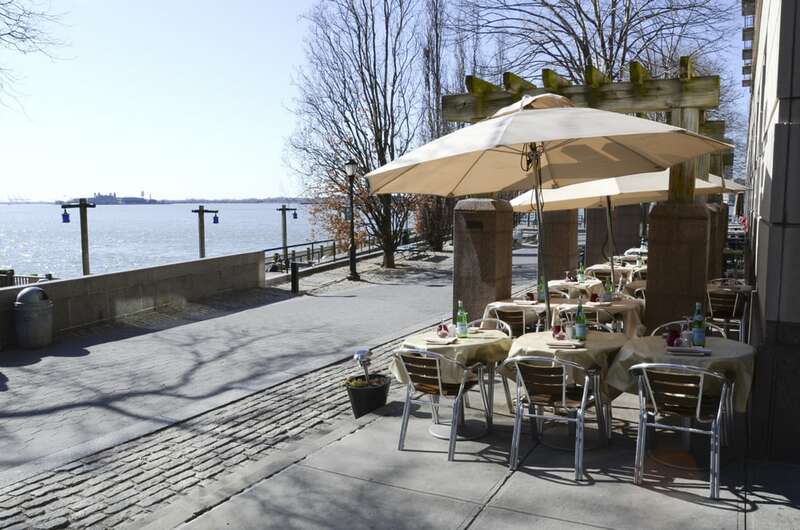 Very good food (for the location) and a perfect ground floor view of the Statue of Liberty with lovely indoor and outdoor seating. Is it the best Chinese in NYC? No, but it's really good and certainly the Chinese restaurant with the best NYC views. 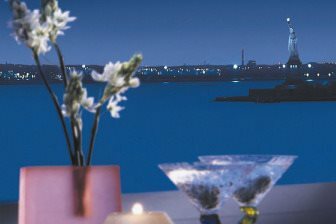 Also check out Miramar Mediteranean & Seafood, right next door, upscale food and the same spectacular view of Lady Liberty. Update: RISE is now only open for private events. Stay tuned while I research other views of Lady Liberty. 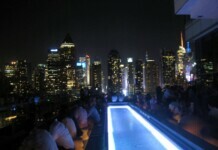 The view from RISE is spectacular! 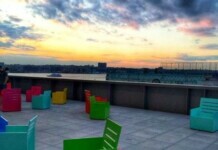 Head to the 14th floor of the Wagner Hotel (formerly the Ritz Carlton) in Battery Park City, spend the $12 on a martini, and take in the sunset over the Statue of Liberty and panoramic views of the NYC Skyline. Definitely try the “New Yorker” three tier platter, especially fun for kids! The mini hot dogs, hamburgers, pastrami sandwiches, pizza and deli sandwiches offer a great taste of NYC’s classics! Call for hours – they open around 4pm. 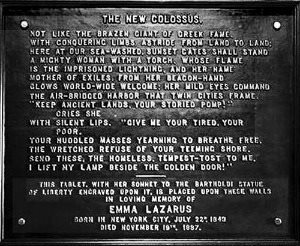 The “New Colossus,” written by Emma Lazarus in 1883, was memorialized in 1903 with a bronze plaque placed on the inner walls of the Statue’s pedestal. It is currently displayed in the Statue of Liberty exhibit. The original handwritten sonnet is housed at the American Jewish Historical Society. Read more about seeing the original Statue of Liberty sonnet free! There are two screening points to get to Liberty Island, once you have Statue of Liberty Tickets. The first is to get onto the Ferry and a second to get into the Museum. Wait time to go through the first security and screening process is usually 45-60 minutes. There is NO WAY to shortcut this line other than have a Reserved Monument Access Pass. All visitors, regardless of their type of Statue of Liberty tickets, are permitted to visit the Liberty Island grounds and the Ellis Island Immigration Museum. The Statue of Liberty, on Liberty Island, and the Ellis Island Immigration Museum, on Ellis Island, are located in Lower New York Harbor, slightly over one mile from Lower Manhattan. Liberty and Ellis Islands are accessible by ferry service only. Update November 10, 2012: While Lady Liberty was scheduled to re-open after almost a year of upgrades, sadly, she was knocked around a bit by Hurricane Sandy and closed until further notice. As of November 1, 2011, all interior spaces of the Statue of Liberty are closed while upgrades are made to the 125 year old pedestal and the 200 year old fort base from which the statue rises. Liberty Island will remain open, so a visit should remain part of your travel plans. What does this mean for you? 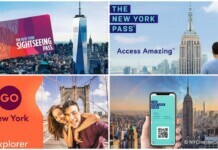 If you are buying any of the New York Discount Passes, just use one of their free ferries to Liberty Island or one of the cruises that goes near the island, but does not drop you off. Do not purchase any separate tours or pass into the Statue of Liberty. National Park Rangers will remain on Liberty Island to greet, educate and inspire thousands visiting each day. 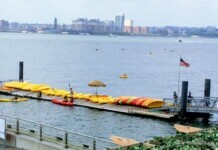 Nearby Attractions: Wall Street, Financial District, City Hall, South Street Seaport, Battery Park City.